Today, the whole world is going mobile and fast. The role of mobile technology is increasing and has major impact on people’s day-to-day lives. Now, investors trust on their smart phones and tablets more than their laptops. Because of the increasing usage of mobile technology, app developers are working hard to meet the needs of these investors. There are a lot of great investment apps on the market; here are some worth checking out to stay on top. Gather important financial news, global market stories, prices in real time and daily analysis of the market, this free app keep you updated with the stock market news, even when you’re on the go. Pros:Quick access to new stories with MarketWatch makes it that much easier to remain up to date with all that you need to know – required for any investor. Cons:This app requires to swipe up and down to check out the latest market update, which is spontaneous compared to swiping left and right and usual in other apps. If we talk about some trusted names in the financial world, there are few that can compete with Forbes. With video interviews, panel discussions, investment articles, and features relevant to the market, this is one app you can’t neglect. Pros:This app gives a good insight about the world of finance from valued professionals. It’s up to date and current news features and enables the user to save favorite videos and features. Cons:This app takes a disappointingly long time to open; with screen freezing issues, some sections are empty. The interviews with top experts in the field aren’t lively but just as you become captivated in an interview, the video freezes. When it comes to up-to-the-minute information on stocks, bonds, commodities, and currencies all over the world, few apps do it better than Bloomberg. Besides trackers for this info, which you can customize as you see fit, the app also offers breaking news and headlines from Bloomberg’s global journalism network. The app presents these features in an easy-to-use, highly eye-pleasing package. Pros:Bloomberg provides lots of customization options; Stock summary and Graphs that help investors make an informed decision. Cons:Users with wide portfolios probably need more information than what Bloomberg app provides. User can’t hide news sections that are not relevant. SigFig stands out for going the extra mile to provide such service that could make it your most trusted adviser. SigFig will give all the information about the hidden fees, overcharges, drifting funds, and other problems that you might use to neglect. SigFig also offers suggestions to optimize your gains. Pros:This app gives you the best way to look at your stocks and other investments. Shows everything clearly, in the best format, suggests better investments according to their automatic algorithms. Cons:Many other investment apps offer complete services for storing and checking investment data and updating your portfolio; SigFig is no exception. If you’re one that uses analyst ratings as part of your research, check out AnalystRT. This app includes analyst ratings for thousands of stocks and allows you to create a watch-list for stocks that you’re considering to buy. Pros:With Analyst Rating Tracker, you can track Buy, Sell, Hold stocks ratings given by research analysts from world’s largest banks and research firms in the palm of your hands. Cons:There is no website interface for the data; you cannot access the same info from website. This app features a unique view of global stocks and ETFs. You can change the way it categories the stocks between percentage gains, market capitalization, volume, and alphabetical. Pros: This app has very attractive, responsive graphical interface that provides a quick view of market trends and charts and summary information. Cons:You can’t monitor ETF’s, mutual funds, or stocks not categorized in the top 100 of their sector. Technical traders would love this app. 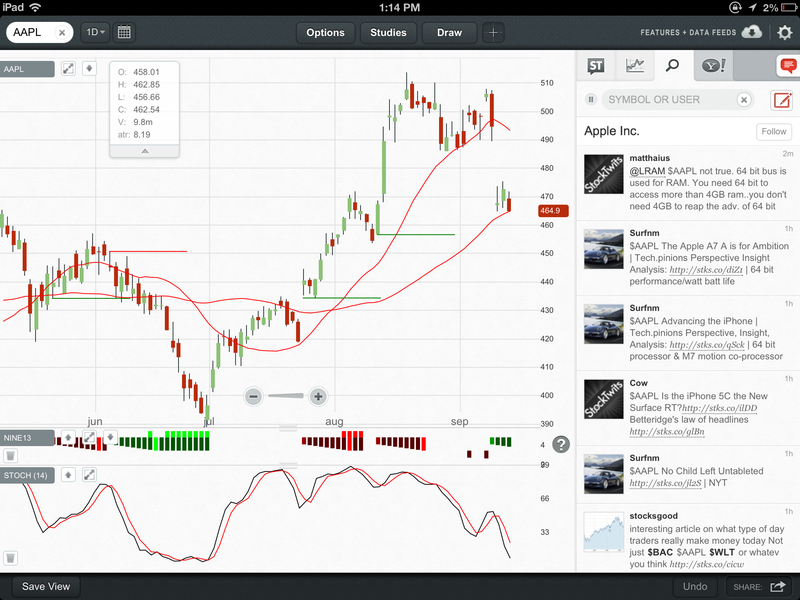 In this app you can view, bar, line, candlestick or wave charts with various indicators. You can even include trend lines, remarks, rays, sections, and zig zags. Pros: all the news, posts and opinions from more than 200,000 users of ST can be viewed at the right of the screen. This is exactly an all-in-one app, that not only allows you to get real-time price quotations for almost any stock, ETF, mutual fund, or option, but you can also buy and sell them. Pros: voice recognition, barcode scanning, educational videos, research reports and additional chart features are added in this app. Cons: Once orders executed, there is no functionality available to easily close out positions from the menu. Motif Investing helps you in making your investment strategies in a safe environment. The app uses themed portfolios to explain the ups and downs of function markets and gives a valuable learning experience. Pros: Motif does offer investors the opportunity to essentially create their own ETFs. Personal Capital simplifies procedures by giving you a platform to organize all of your investment information in one suitable place. The app’s greatest deal is its simplicity and effectiveness; it will shorten your broad financial status in into a concise summary. Pros: Personal Capital can be used on your computer, smart phone or tablet. This makes it easy to check or track accounts on the go. Cons: There really isn’t much bad about this app. It’s exceptional for a free tool. StockTwits is just like Twitter for traders. Along with the Twitter-style feed, there are some traders who also post charts and videos offeringfree technical analysis. If you’re a short-term broker, this is very useful app to watch and top of all, it’s free. Pros: StockTwits is ideally suitable for those who need a social network to keep them updated in to what other investors are thinking and doing. Cons: Twitter feed doesn’t update often enough, the stream doesn’t automatically update. The CNBC Real-Time app gives you free access to real-time stock prices – before, during and after market hours, straight from both the New York Stock Exchange and NASDAQ Marketplace. Pros: In this app, additionally you will receive CNBC breaking news alerts, top news stories & analysis, and access to the latest CNBC business video clips, interviews and market updates. Cons: The ads in this app are problematic and exhausting. The previous version was reasonably good as the ads used to take a very little space. However the current version has the 10 percent of the content space and ads never disappears. The Daily Stocks app can provide you all the technical updates of the market and is aimed to focus on trends in the marketplace built on some technical analytical techniques. This kind of information is mainly the field of fairly serious traders. Pros: Daily Stocks works great in landscape and portrait mode, but landscape mode shows you a little more information and it’s very easy to use. Cons: There is lack of international markets data information; means that non-US investors will find it somewhat inadequate. Yahoo Finance app is a complete finance place. It delivers breaking news, related market synopses, lending rates, and other financial news. In this app, there are segments for investing, news & estimation, personal finance, and tools for chasing the market and creating an online portfolio. Pros: Yahoo Finance is complete and has information for every investor, regardless of experience or knowledge. Cons: The data loading issues and the overall usage make it not nearly as user friendly. Stock Guru is a robust engine that delivers real time study for nearly 7,000 stocks. You can analyze risk, drive, financial power and a exclusive guru rating that sums up all of the data for those who don’t want to dive into the details. Pros: This is the only hedge fund holding tracking app in the market to view hedge funds. Cons: One downside in this app is that it doesn’t have enough hedge funds in their database.